The following article is reproduced by permission of the authors from the Spring 1999 edition of Breweriana Collector. Mascoutah Brewing Company: The Brewery That Refused To Die. At one time or another, virtually every town of any consequence in southern Illinois has had at least one hometown brewery. Of the many breweries that have come and gone in the area, few faced, and overcame, as many obstacles in an effort to remain in business as the Mascoutah Brewing Company. It was able to survive fire, a tornado, fierce competition, and for a while at least, even Prohibition, before finally meeting its demise. Today a bedroom community of around 6,000, Mascoutah, Illinois is located southeast of St. Louis, in the shadow of Scott Air Force Base. While nineteenth century Mascoutah was dominated by German immigrants, surprisingly, its first brewery was established by a native of France. Charles Bocquet started making beer around 1853 at the corner of East Green and North Lebanon Streets. In 1857, a newspaper in nearby Belleville reported that Mascoutah had four breweries in operation. In addition to Bocquet, the 1860 census listed three German immigrants who reported their occupations as brewers - Max Lutz, Adam Bruegel, and George Winter. It is unclear from the census records if they had their own establishments, or were working at other breweries in town. The Bocquet Brewery operated for a few more years, and then closed. Charles Bocquet's pioneering brewery was eventually torn down in 1889. Towards the end of the Civil War, another brewery arose on the western edge of town, east of Silver Creek, near Paul Street and the county road. The building on this property had originally been built for use as a distillery in 1857, but was converted to beermaking in 1864-1865 by Leonhardt Heilegenstein and Peter Freidrich. Like Bocquet, both were from France, but were different in that they had no brewing experience. Heilegenstein was a brickmaker by trade, making him an ideal candidate to build a brewery, while Friedrich had turned from farming to running a hotel and barkeeping, putting him in a good position to sell the new Mascoutah beer. To do the actual brewing, they turned to brewers Jacob Wunderle, a German immigrant from Hesse, and Prussian native Nicholas Kruse. While Heilegenstein's association with the brewery was apparently brief, his Lincoln Lake Park would play a significant role in the area beer business in future years. In its early years, the new brewery stored some of its beer during the winter in brick caverns on the west side of nearby Silver Creek. Since the creek was prone to spring flooding, this actually aided beer delivery, to points west during high water periods! The brewery remained small, producing about 400 barrels a year during its first decade, during which time it was taken over by two men with the last names of Hermann and Eisele. Production began to increase, and William F. Kohler soon bought out Hermann's share. By the mid 1880's, construction was started on a new, larger brewhouse directly in front of the old one, increasing yearly capacity to 3,000 barrels. The brewery's product was briefly called Eisele & Kohler Beer, but was changed back to Mascoutah Beer when the change proved unpopular. In April, 1886, the firm controlling the brewery was incorporated as the Mascoutah Brewing Company. Stock of $10,000 was divided up at $50 a share. Incorporators included Henry Wuench, president; William Kohler, vice-president and plant superintendent; West Mascoutah pioneer, lumber dealer and saloon owner H. F. Teichmann, secretary; and postmaster, printer, and Civil War hero Fred Dilg, treasurer. Joining these four men on the board of directors were Louis Guth and Charles Lippert. Within a few years, following the death of William Kohler, George Scheibel had become company president as well as brewmaster. This was a time of continuing expansion at the brewery, which was needed to keep up with strong local competition, including the Star Brewery of Belleville, located about ten miles to the west and capable of producing over 25,000 barrels annually. An 1887 article in the Mascoutah Herald reported that the ice crop was being harvested by a crew of 54 men, hired by Leonhardt Heilegenstien, the proprietor of Mascoutah's Lincoln Lake. The lake's 64' x 34' ice house was filled with ten inch thick ice blocks, and Heilegenstien also filled the Star Brewery's ice house near the railroad depot. At the Mascoutah Brewery, a new malt house was completed in October of 1891, and to celebrate a Wurstmarket (street fair) was held on the brewery grounds, drawing hundreds of people. That year, the city of Mascoutah began plans to set up a system of electricity, and in anticipation of this happening the brewery renamed its bottled lager, which had always been called simply Mascoutah Beer, to Electric Brew. By the time the city power plant was completed in 1892, Electric Brew had swept the local market, and had become a good seller in St. Louis as well. It was to become the company's best known brand. One source says that the name also referred to the fact that electricity, which was believed in that age to have mysterious health benefits, was somehow used in the brewing process! Rumors of the brewery adding electricity somewhere into the brewing process may have not been that far-fetched, when considering that in 1879, Leonhardt Heilgenstein is known to have erected a public bathhouse in Mascouth for giving medicated and electrical treatments. Several other lesser brands were produced by the brewery as well, including Eagle, Salvator, Special Brew, Hi-Grade, special Christmas beers, and a Wiener Marzen, which was featured in the spring. The Mascoutah Brewery also produced Columbus brand beer, which was brought out in October, 1892, during the 400th anniversary of the explorer's landing in North America. A bock beer was produced every spring. At an 1895 board of directors meeting, the yearly bock beer was given the permanent name of Muenchner Hofbrau Doppel Bock. Like other breweries of the time, the Mascoutah Brewing Company added a modern ice house to its plant, completing it in 1893. The company became the town's major source of ice for many years. On May 27, 1896, a series of tornadoes struck Mascoutah and the surrounding areas. The first tornado had touched down in central St. Louis, then moved on to ravage the Eads Bridge over the Mississippi River. About 200 people were killed in St. Louis alone, and a like number in East St. Louis. Once in Illinois, one or more of the tornados proceeded on a path to, and through, Mascoutah. While there was only one death in Mascoutah, the town sustained major damage. The tornado both hurt and helped the brewery. Pictures taken at the time show considerable damage to the second floor of the brewhouse, but it was soon repaired. A St. Louis brewery had just completed a depot in downtown Mascoutah, hoping to take advantage of the upcoming tourist season during which many out-of-town visitors would take in the amenities at Lincoln Lake. Their plans to have them drink their product rather than Electric Brew were foiled when the depot was destroyed by the tornado! In November, 1899, another potential disaster was narrowly averted when an early morning fire engulfed the stable at the brewery. Driver Emil Merkle had just hitched up his team and driven it to the front of the building to pick up beer for local deliveries when he noticed flames shooting from a hayloft. Brewmaster Anton and others on duty attached hoses to a second floor water tank, and to the brewery's steam engine, which enabled them to douse the flames which were just spreading to the pumphouse. The city fire department then arrived and kept the blaze confined to the stable. Fortunately, the three horses that had been remaining in the stable at the outbreak of the fire had been safely rescued, and overall damage was limited to about $400, as the rest of the facility was saved. Ironically, the stable had been the only company building not insured. To help market its beer, the brewery was a consistent advertiser in the Mascoutah Herald. Ads were always of a similar format, listing the corporate officers, and text such as "Brewers of first-class Lager Beer -- In connection with the brewery is a bottling establishment. Fine bottle beer always on hand, bottle beer and ice delivered to any part of the city on short notice." 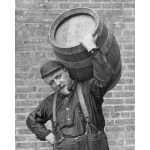 There may have been a shortage of kegs at times, for some ads published shortly before the turn of the century asked, "Please return kegs as soon as empty. We need them. Keep kegs out of the sun." The brewery continued going strong under various changes in management. Over the years a number of the town's leading citizens served as corporate officers, including local merchant Ernst Hagist as president. The elements were again unkind to the brewery in 1901, when he brewery pond began to go dry during an early summer drought. Pipes had to be laid from Silver Crek to supply water to use in the plant. The dry weather continued through the fall, when so little water was available that the ice plant had to be shut down and beermaking suspended. In 1902, they lured Oscar Klinke from Anheuser-Busch to become assistant superintendent (brewmaster). He was soon elevated to head brewmaster, and in 1904 attended brewing school in Chicago prior to spending several months in Germany visiting his parents. Klinke arranged to have John Scharrer take his place while he was gone. According to a newspaper account at the time, Scharrer was "the man who for years past has been Anheuser-Busch's favorite brewer." In 1910, the brewery brought out a culmbacher style of draft beer, marketed simply as Culmbacher. The same year, they also began a promotional giveaway in support of sales of Electric Brew, which had been reformulated. A coupon was given with each purchase of twelve pints of beer. Consumers could then redeem seven coupons for a stein, twenty for a tankard, and 54 coupons for a set of six steins and one tankard. By 1914, management of the brewery had changed again. George W. Lischer had become company president, while Paul Schroeder wore two hats, that of vice-president and brewmaster. William C. Stork, another veteran of Anheuser-Busch, and also the Western Brewery in Belleville, was chief salesman. Local banker and insurance man Gustav Scheve had become treasurer. Shortly before Prohibition, Schroeder was elevated to president, with George Hamann taking over as secretary after resigning as deputy St. Clair County recorder. Paul Schroeder was an accomplished beermaker. Born in Frankenhausen, Germany in 1876, four years later he had moved with his family to Williamsport, Pennsylvania, and attended the public schools there. Schroeder later attended the United States Brewing Academy in New York City, graduating in 1899. He was then hired by his father-in-law as foreman and brewmaster at the Star Brewery in Williamsport. In 1904, Schroeder moved to the Midwest, buying an interest in the brewery in Sainte Genevieve, Missouri, and relocating there. He resigned as director and manager at that plant in 1909, to move to Mascoutah. In 1919, with the outlawing of alcohol becoming a grim reality, the Mascoutah brewery changed its name to the Mascoutah Products Company, and began manufacturing a beverage called Old English Double Diamond Brand Ginger Beer. The company continued in the ice business and also started making "Masco" beverage near-beer. But while Prohibition brought an end to the legal manufacture of beer, it did not deter the Mascoutah Products Company. In late 1920, the brewery was one of many charged in court with selling real beer. A truckload seized in Belleville during the "Ding Dong Days" (an annual fete in Belleville for a number of decades) was traced to Mascoutah. The company later pleaded guilty to making beer with an alcohol content of 2 to 4 1/2%, and was fined $1,500. In the fall of 1922, sixteen half barrels of beer were confiscated at Edgemont Station near Belleville. While the truck driver had refused to tell Prohibition officers where he had picked up the load, it was believed to have come from Mascoutah, as the tip to watch for the truck had come from an agent there. This led to a raid of the Mascoutah brewery. Bottles found on the premises were again discovered to contain real beer. The brewery was described as the "fountain head" of real beer in the area. Federal agents from Washington, D. C. soon arrived in Mascoutah, and placed a padlock on the brewhouse! Soon the ice plant was taken over by a concern calling itself the Eureka Beverage and Ice Cream Company. This company also leased the brewery's boiler room to the Shelton Panama Hat Company for heat, and for use in pressing hats. The Shelton Company had recently opened in the former bottling house of the brewery. In March, 1923, however, it was announced that the ice plant was shutting down. According to the Mascoutah Herald, "Being without an ice plant makes it a hardship for the citizens of Mascoutah." Attentive local citizens noticed that there was still some activity in the buildings of the "closed" brewery, though. Some would later recall trash being burned on the site in order to cover up the aroma of roasting malt. In February, 1924, a train carload of Mascoutah beer was seized by Federal agents in Chicago. The brewery had been busted again! Six hundred barrels of real beer were found in the storage cellars by members of the "brewery squad," and six men were arrested. According to agents, the brewery had been sold in November 1923 to Joseph McFadden of Joliet, and was one of fifteen to twenty "cheating " breweries in the state. This was the last straw for the "Feds." For repeated violations of the Volstead Act, the brewery was not only closed again, but this time seized by the government. Those arrested received jail terms of six months to a year, and were also heavily fined. By January, 1925, the government was dismantling all the brewing equipment, and selling off everything but the building and ice making machinery. Junk dealers were buying the iron and brass, while vats were being sold for use as cisterns, cooperage for firewood. The remaining dry years brought only more bad news to the old brewery. Its luck had finally run out. Paul Schroeder, the last official brewmaster, and the man who had guided the company in the decade prior to Prohibition, died in May, 1926. He was only fifty years old. George Hamann, the brewery's final secretary, was found dead under mysterious circumstances a few years later, possibly having committed suicide, after embezzling money from some investment clients. Meanwhile, the brewery buildings sat idle and neglected. On March 13, 1933, an afternoon fire ignited the roof of the former stockhouse of the Mascoutah Brewing Company. It was speculated that the cause was either a smokestack spark from the nearby Langenberg Hat Company, which had purchased additional portions of the brewery, and was using part of it to store oil and other items, or from combustion of sawdust which remained between the second floor and roof of the stockhouse, and had been used as insulation back when beer was stored there. Firemen poured two streams of water on the structure (which had been previously condemned by the state fire marshal) for five hours. Flames re-ignited later that night, and firefighters returned for three more hours. A newspaper article discussing the fire described parts of the buildings as having all doors and windows broken out, a leaky roof, and "the entire structure is a mass of ruin." Less than a month after the fire, the country could once more legally drink beer, but none of it would be made in Mascoutah. The last intact part of the brewery continued to be used to make hats, and later was turned into a raincoat factory. Today, on the far end of Eisenhower Street where the brewery once stood are two long, one-story buildings being used by small businesses. Behind these buildings are a few acres of vacant land, including a pond. Save for the original underground lagering cellars (which are now open to the sky), there is little visible indication that a brewery was ever on the site, and we breweriana collectors are among the few who remember the story of the brewery in Mascoutah that refused to die. The authors would like to thank the following for assistance in preparing this article: Bob Kay. Sources included The Mascoutah Herald; two Belleville newspapers, The Daily Advocate and the News-Democrat; newsletters of the Mascoutah Historical Society, especially an article entitled "Beer and Mascoutah" by Alfred Worms; 1881 and 1907 St. Clair County Historys; 1890 City County Directory; U. S. Censuses of 1860 and 1870; 1874 & 1901 St. Clair County Atlases; and Guide to Embossed Bottles of St. Clair County. A special thanks to Lisa Bumpus who provided the authors with innumerable items on the brewing industry in Mascoutah, and was kind enough to answer a classified ad begging for information; and the Mascoutah library for its excellent collections.